Screenplay: Daniel Monzon, Jorge Guerricaechevarria. Starring: Luis Tosar, Alberto Ammann, Antonio Resines, Manuel Moron, Carlos Bardem, Marta Etura, Luis Zahera, Fernado Soto, Vicente Romero, Manolo Soro, Patxi Bisquert, Miguel Martin. Like “Let the Right One In” and “The Girl with the Dragon Tattoo” this is another European film that has unashamedly been set up for an American remake already (Paul Haggis being the man involved). Seldom are remakes anywhere near as good and yet again, this will prove a hard one to match. Juan (Alberto Ammann) is about to start work as a prison guard and is taking a tour of a maximum security area when he is injured slightly in an accident and left behind as a riot breaks out. 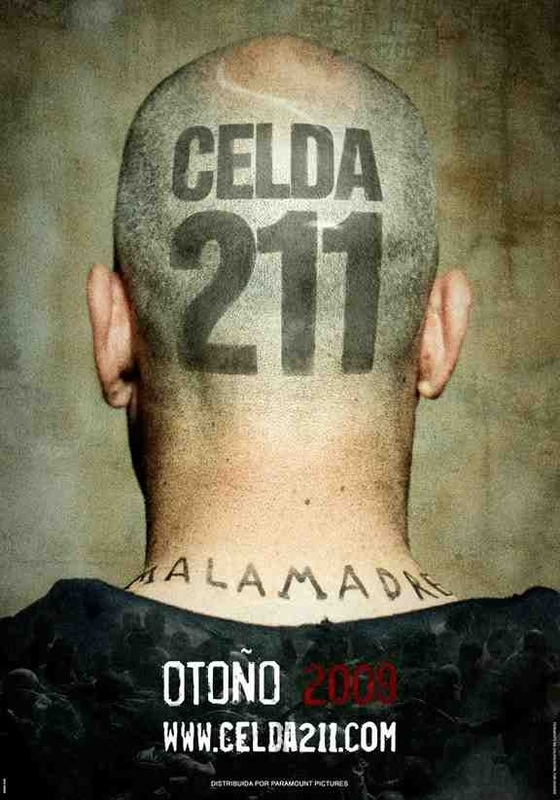 Juan convinces Malamadre (Luis Tosar), the convicts’ leader, that he is a new inmate who has been beaten up by guards, and the two men become close as the crisis escalates. The film opens with the look of a low budget television film and at first I began to think I shouldn’t have listened to the plaudits I’d read of this. Not before long though, it really kicks into gear and cranks up the tension and excitement. Within minutes I was hooked. I’m an avid fan of prison drama’s, with their high level of suspense and on edge atmosphere and sense of danger. This is no different and wastes no time in exposing you to the violence and brutality of the inmates. Helped no end by two excellent central performances, particulary Luis Tosar as the snarling dominant ring leader. Director Daniel Monzon keeps the story briskly moving with several moments of unbearable and skillfully handled suspense and the fact that it avoids the usual genre conventions with many unexpected plot developments, helps in keeping you captivated and wondering what direction it will go in. European cinema seems to be reaching a bigger audience these days and this is another worthy of attention. Fans of the 2009 French film “A Prophet”, or any prison drama for that matter, should find plenty to enjoy here. An excellent well crafted film that delivers tension in spades. This entry was posted on January 19, 2012 at 12:38 am and is filed under Crime, Drama, Foreign Language with tags 2009. You can follow any responses to this entry through the RSS 2.0 feed. You can leave a response, or trackback from your own site.